Set up as a research unit in the experimental township Auroville, in south India, in 1993, The Colours of Nature has revived the ancient traditions related to natural dyes. A long search led the Founder, Jesus Ciriza Larraona, to a small village and a family that had handed the knowledge of natural indigo fermentation dyeing down for generations. Most of our team remains until this day. We continue to explore the cultivation, harvesting and processing, adding natural elements such as sea shells, to improve our processes. Key parameters are colour palette, fastness and eco‐friendliness. We have used the same water in our vats since 1993 and no water is ever wasted. TCoN started as an Auroville R&D unit. In 1993, Jesus finally found a village, Guledagudda in Karnataka, where some families had kept the knowledge of the natural indigo fermentation process alive. One of them sent Subhash (see image) to help Jesus set up four 200 litre vats. Subhash spent three months passing on the necessary routines. But after he left, Jesus realized that there were issues around the fermentation process due to the fact that also in this village all of the indigo applied, by this time, was in fact synthetic. The tell‐tale sign? The absence of smell. It took TCoN a few more months to revive the fully natural indigo fermentation process. 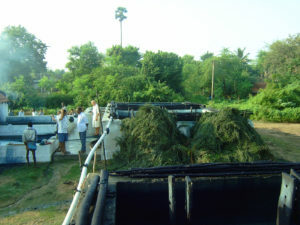 By then, a permanent site in Auroville had been found and a unique, truly eco‐friendly natural dye unit was born. 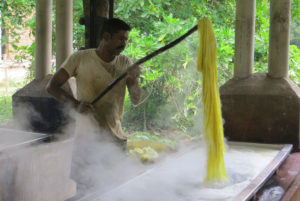 Master dyer Kumar remains since the beginning, now as part of a team of 24. Our 40 vats (19,000 litres of indigo dye solution; no water wasted since 1993) can dye up to 30 kg of material per day, depending on the depth of colour required. We get our indigo cakes from a village only 60 kilometres from Auroville, which happens to be a world leader in natural indigo supply. 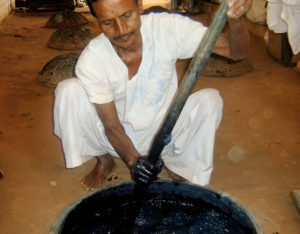 There, indigo is extracted from Indigofera tinctoria leaves. On our site we grind the cakes, then add the powder to our vats. Since we wash using only biodegradable soap and have a water treatment system, all the water is re‐used for our gardens. Once we start to cultivate indigo in own field, we’ll close the loop completely. Specialised in natural indigo, we have mastered a full range of lightfast colours including yellow (Marigold flower) and red (Rubia cordifolia). For an extensive list of plants we use, see “Plants we Dye With”. Traditional Indian dyers used myrobalan, alum, wood ash and dye extracts and we build on this knowledge. At The Colours of Nature we don’t use chromium or synthetic alizarin. For indigo, we don’t use hydrosulphite, a hazardous pollutant that may leach on to the wearer’s skin. We plan to expand to 100 kg daily capacity and dream of 1,000 kg. We also want to expand indigo cultivation on Auroville lands. This dye‐yielding plant can revive barren land and provide income to rural women gatherers. Its only by‐product? Compost.